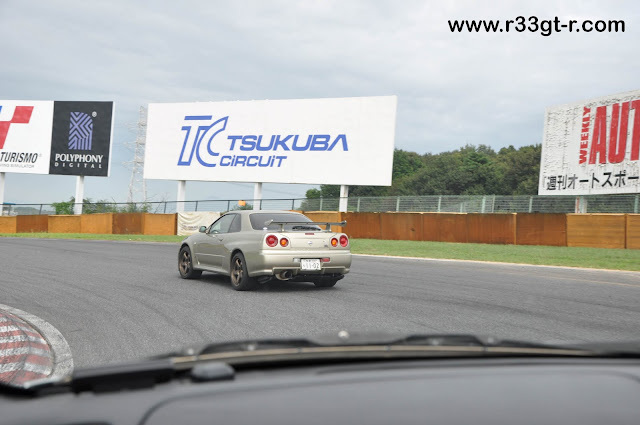 SSCT Track Day At Tsukuba Circuit – with special guest world famous pro driver and racing team owner Masahiro Hasemi (“Mr.Skyline”)!! Another hot September day, this time on the unforgettable date of September 11. However, this was to turn out to be a happy September 11 for me. (and apologies for not posting for a while... I have some mods and some upgrades that I will post on soon). 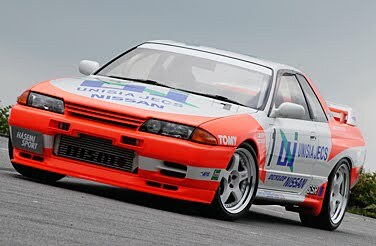 As my friend Alex, who had signed up and was ready to go, had a last minute mechanical issue which prevented his car from running, he found Terrance (white 97 R33) to come along with us. As it was Terrance’s first time, we got there early, and walked around to check out the track. 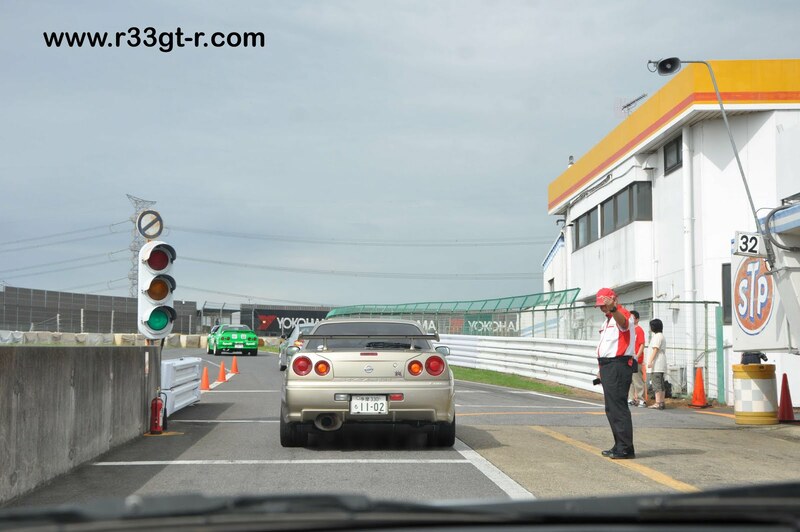 The GT-Rs started arriving around 1130, about 2 and half hours before we were set to run. That gave us plenty of time to prepare the cars, however. I was most concerned about my brakes, as I had just finished changing out the front pads for new ones (PFC Race) and done a complete flush of the system (I used Endless RF650). On the drive up, I noticed that the brakes felt mushy, nothing like the “instant-on, get face thrown into windshield” that I was used to with the PFC rotor and pad combination. 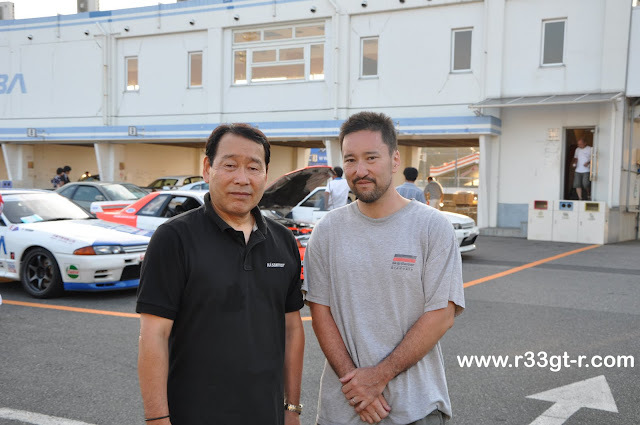 So I had Yamada-san, the Nissan race mechanic check it out – he did and said he felt nothing wrong with the brake pedal, suspecting (as I now did) that the pads simply hadn’t been bedded in properly. I had tried to do this quickly the day before, but it was obvious that I had not generated enough heat. So he advised me to take it easy during the first of my two 25 minute runs. The first will be a “throw-away run,” as he put it. 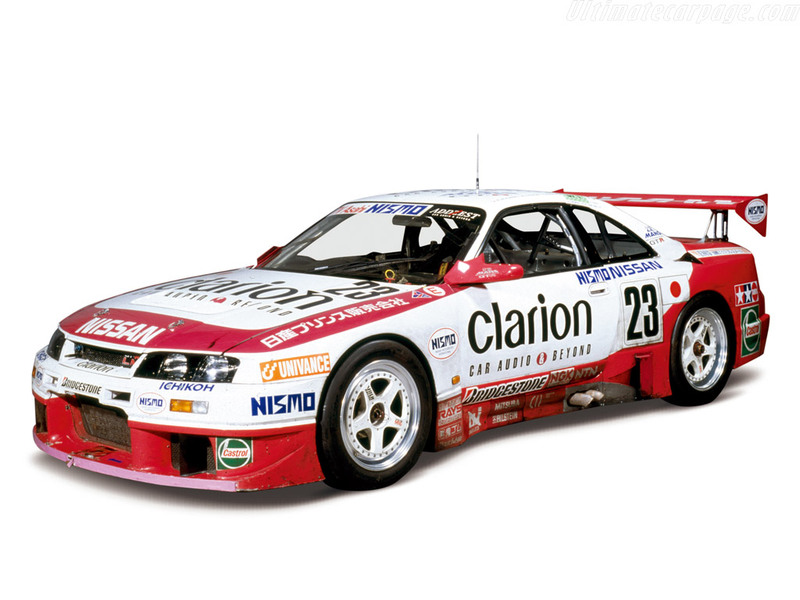 Here I am checking to make sure my wheels (note I ran on the standard 17 inch rims and the very good Dunlop Star Specs!) don’t fall off. 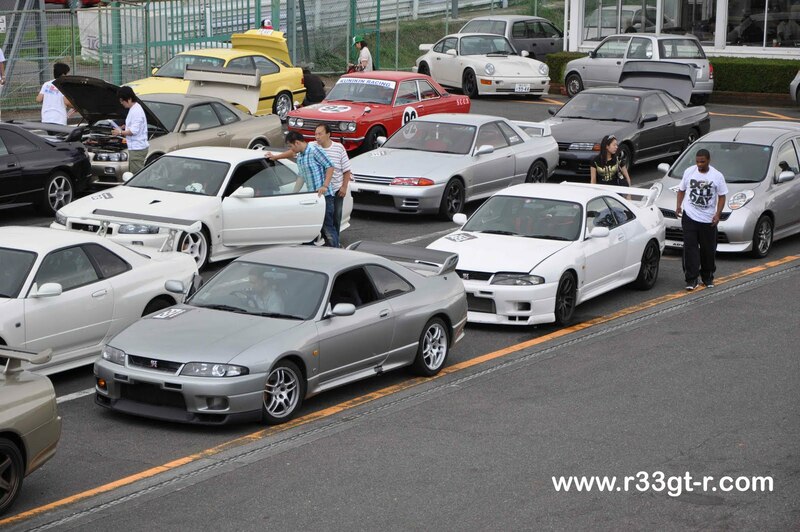 The cars were split into two groups – the “A” group and the “B” group. 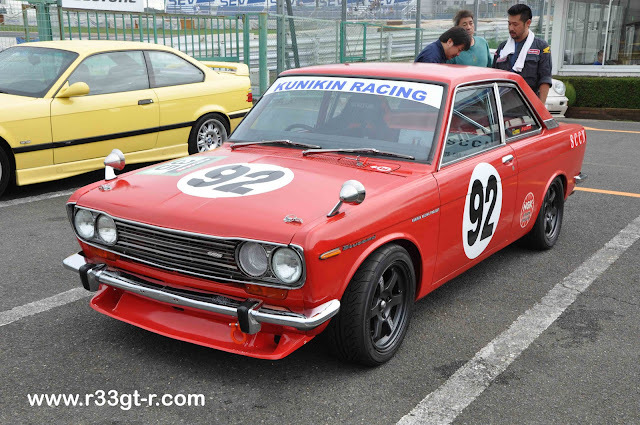 As you can see, the “B” group I was in had some interesting cars…not just the March (aka as a “Micra” overseas – this one with a manual transmission, a rare car!) 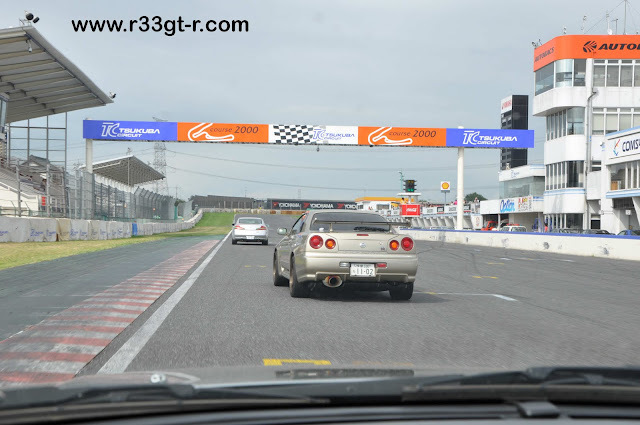 but also a classic Nissan Bluebird, and also an R34 GT-R M-Spec, which was right in front of me during the warm up lap. After the “A” group finished their first 25 minute run, I went out with the rest of “B” group, followed closely behind by Terrance. 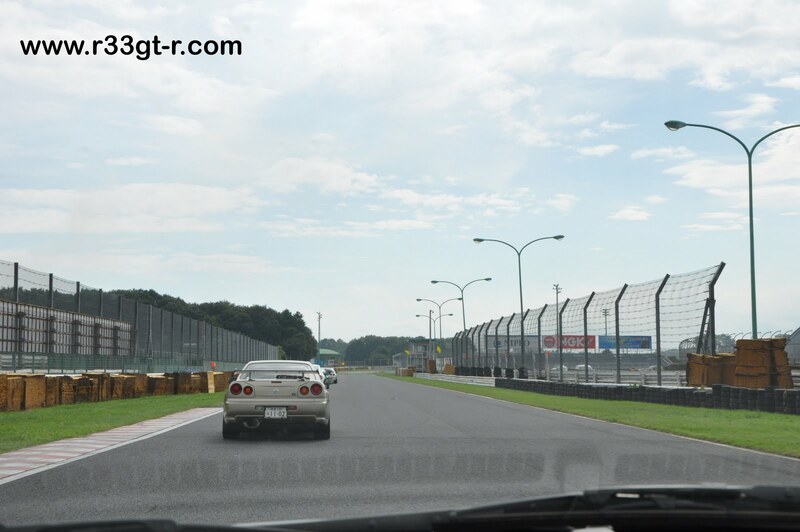 Alex and I had given him a good briefing earlier, and we were able to watch the action of some highly tuned BMW M3s from the grandstands at the first hairpin. I had told Terrance I would be taking it easy, maybe 60% on my run, but, after leaving the pit area, I felt the car REALLY respond. And as for the brakes, the more I used them, the better they got. 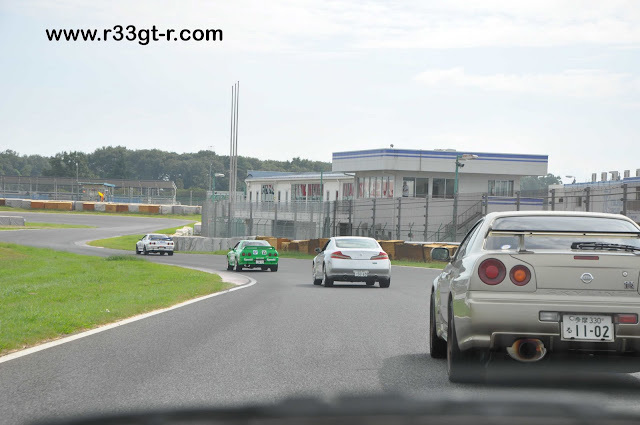 So, I picked up the pace… and soon had no one in my rear view mirror. To Terrace’s credit, he did a great job, I did not lap him once. There was a V36 Skyline sedan(!) 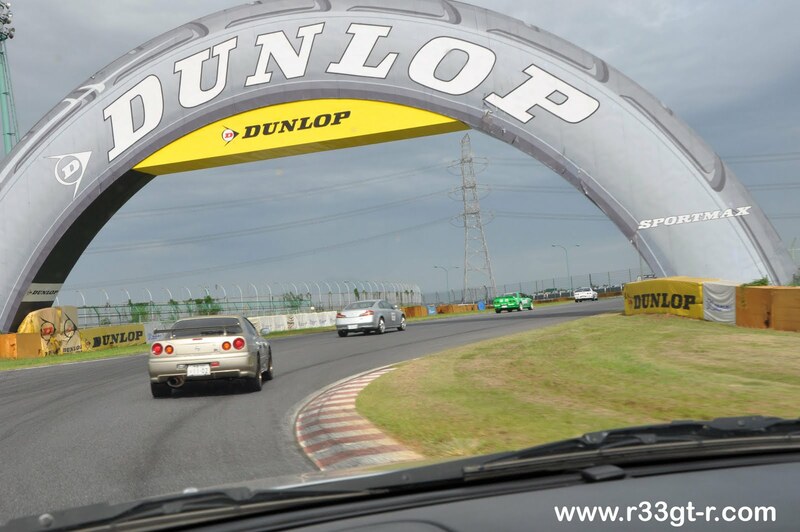 on the track that I lapped 3 times, as well as a purple BCNR33 that I also lapped twice. Obviously first time on the track for both of them? So the fastest lap of the day was 1’04”, set by Goto-san in his insane R32 – he was in the “A” group. 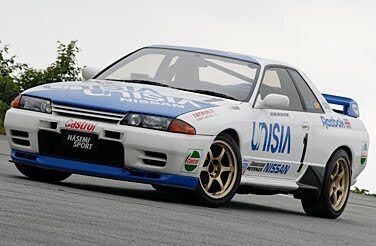 Basic specs on that car are – 18 inch TE37s, 355mm rotors up front (F50 Brembo), stock rear Brembo caliper with V36 Skyline coupe 350mm rear rotor, HKS VCAM, and HKS 2530 turbos, producing around 600ps. Fastest time in the “B” group was 1’09”, I suspect by one of the white R34s that I was following and swapping positions with. 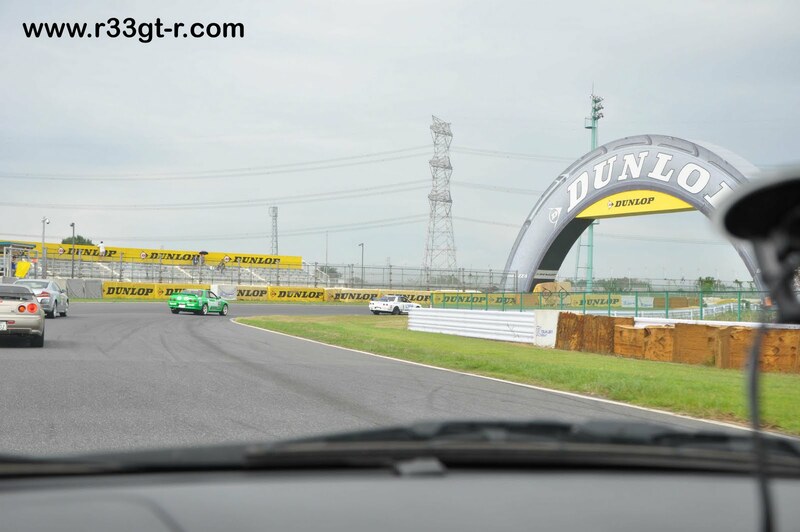 Alas, my best was a 1’11” – still 3 fastest of 21 cars… but I’m blaming this on the still very sticky but not s-tire level Dunlop street tires and the slow traffic I constantly had to weave in and out of. 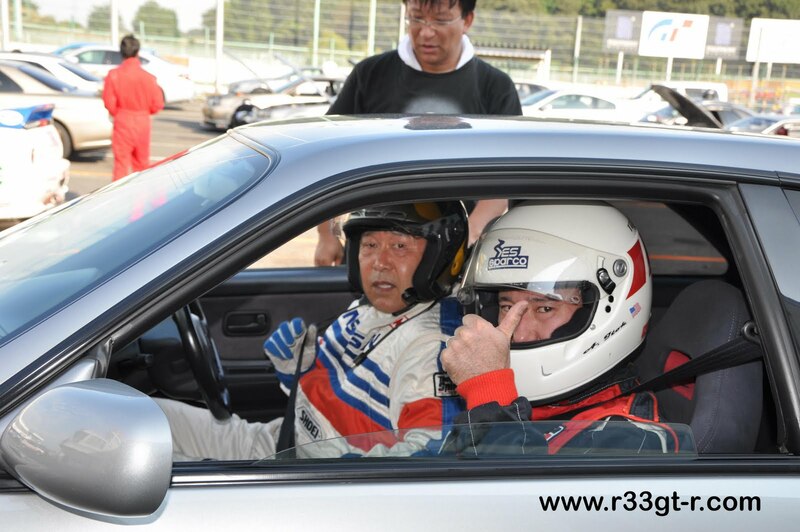 Oh well, next time I’ll request to be put into the faster group… although Koyama-san (of Nissan Prince Shinagawa) DID comment that my driving had noticeably improved, that I was consistent and very smooth – which, to be honest, was all that I was going for, being that the heat was driving up the engine temps and I wasn’t about to push myself or the car too much. Ignoring my idiotic comments – Hasemi-san had nothing but good things to say about my car. He liked the balance, and said the engine ran well. 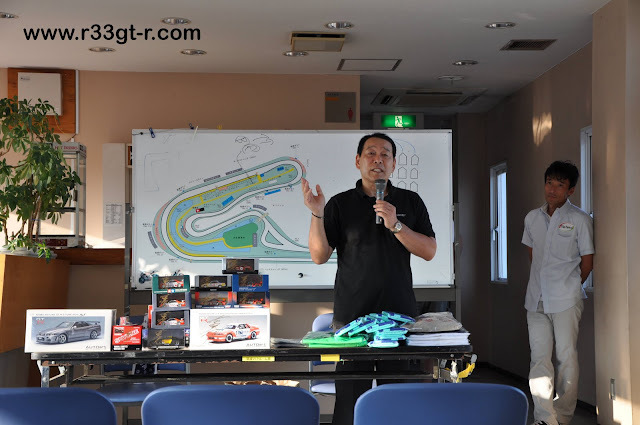 In the debriefing after the run, he told the club that, despite having driven about a dozen GT-Rs, there were only 3 he truly thought were good cars. One was mine! As you can hear in the video, he says the balance of my car is very good, with absolutely no understeer, making the car very fun to drive, and fast too. Credit for this photo from this very interesting article from Speedhunters. 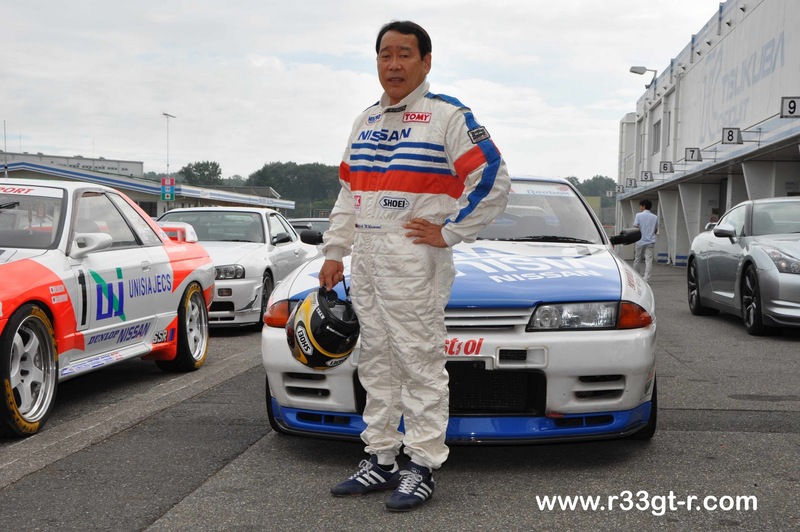 During the debrief he had some interesting stories – apparently the aerodynamics of the R32s were not good, resulting in an increase in understeer. 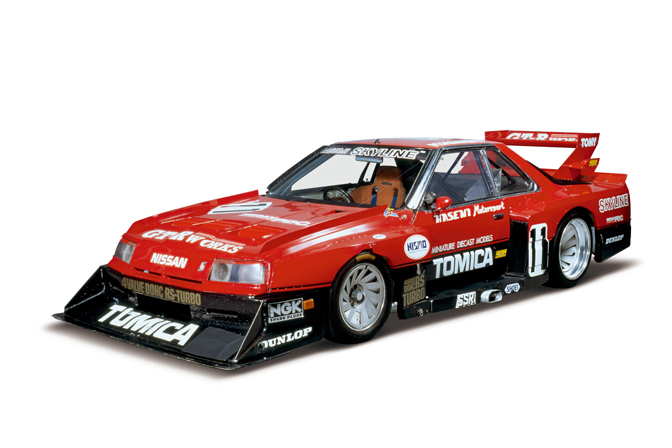 The Group A rules though meant the car had to be pretty much as it left the factory – so no huge wings (which, he commented usually don’t work well anyway – in fact the R32 is fastest without the rear wing), and the racing teams tried various ways to minimize the drag the rear standard wing caused, like adjusting the trunk hinges so the front of the trunk lifted up a bit, etc. Currently he is now owner of Hasemi Motorsports, a race team that is still active. So anyway, that was my brush with greatness - I guess it’s like having Mario Andretti or Richard Petty (for Americans) or Alain Prost or Nigel Mansell (for F1 fans) drive your car… and come away impressed with it!